The Simulation Centre is a great place for people with a disability looking for a day out with recreational and leisure activities. Safe away from busy public traffic areas. Slot cars, an 8 lane scaletrix track, WA’s largest commercial track. - the Slot Cars are ideal for someone in a wheelchair, hand controllers are at a low level - there is a trigger for control. 9D Cinema with wind, rain, snow, bubbles and more - no more than one wheelchair in the room at a time. Customers not wishing to seat on the ride - we can offer them a chair to sit in to view from. Not recommended for persons with epilepsy. Please see full terms and conditions at the venue. Multisport simulators with baseball, cricket bowling, soccer, ice hockey, basketball, zombie dodgeball, carnival games, NFL and more - an interactive kicking and throwing zone. Great area for exercise and movement, with repetition. Golf Simulators - play a course, practice on the driving range. Good for hand eye co-ordination and balance. Precision movement. The Gamers Den - A chill out zone full of Xbox, Playstation 4, Nintendo switch. An ideal area for social engagement in a different environment. Our charge is $15.00 per person for 1 hour of play, add a movie ride in it’s an extra $2.50. We encourage you to make a booking to avoid disappointment. If we can be of any assistance in your group bookings or events, please do not hesitate to contact us on 9494 2717. Funding may be available through NDIS or Department of Community Services for some of the programs offered here at The Simulation Centre. Please check with your Local Case Worker if you are eligible for funding. We understand that sometimes it's hard for client's to understand where they are going and what they will be doing. To help you and your client, we have developed a power point presentation with pictures, simple words and youtube videos to help you guide your person through the journey of entering and playing at The Simulation Centre. Please note that the powerpoint presentation is a work in development. We have loaded up a PDF Version for you to use or alternatively if you would like the full version with youtube video please contact us on 9494 2717. We understand how difficult it can be to have a party for special person. 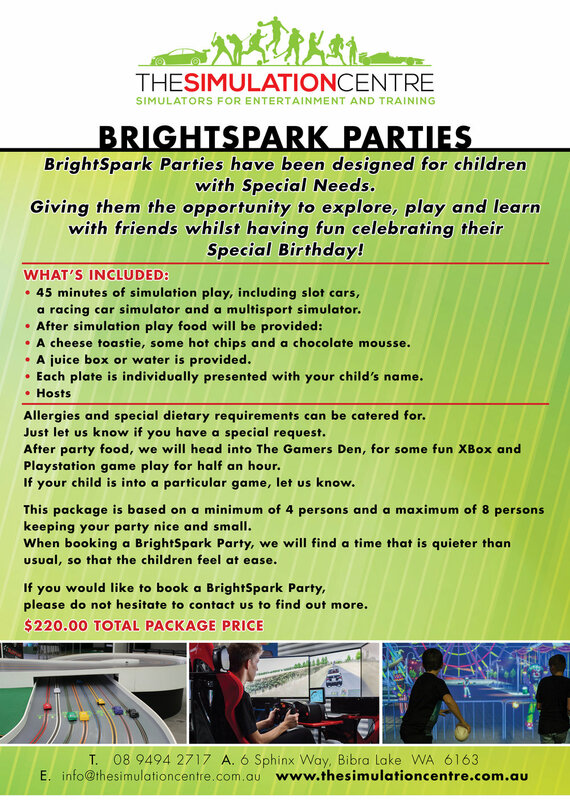 We hope that this party package we have designed will ease the pressure, so that you and your birthday person can have a fantastic party at our venue. If you have any special requests please do not hesitate to give us a call on 6263 5132.